Alec Martinez's last-minute goal gives Los Angeles a 4-3 win over the Rangers. 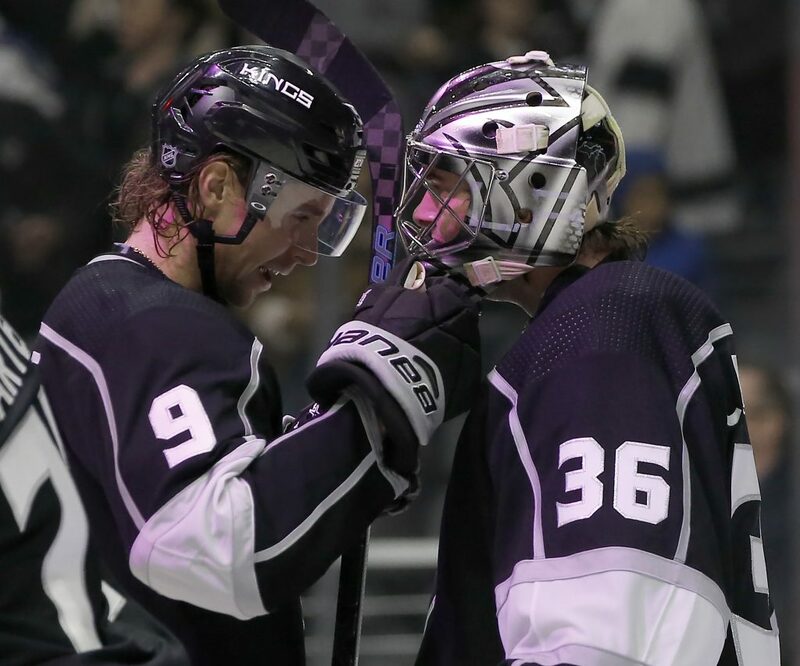 LOS ANGELES — Alec Martinez scored with 55 seconds remaining, and the Los Angeles Kings stopped a six-game skid with a 4-3 win over the New York Rangers on Sunday. Martinez brought the puck from behind the net into the offensive zone and fired a wrist shot through the legs of Brendan Smith and past goaltender Henrik Lundqvist for his first goal of the season. Ilya Kovalchuk had a goal and two assists for the Kings. Dustin Brown, making his season debut after breaking a finger in the final preseason game, also scored. • Kings goalie Jonathan Quick was placed on injured reserve because of a lower-body injury, General Manager Rob Blake said. OILERS 2, BLACKHAWKS 1: Connor McDavid scored 53 seconds into overtime to lift Edmonton to a win at Chicago. RED WINGS 4, STARS 2: Anthony Mantha, Tyler Bertuzzi, Jonathan Ericsson and Justin Abdelkader scored as Detroit won at home for the first time this season. Jonathan Bernier stopped 28 shots for his first win as a Red Wing, after signing as a free agent in July. Gemel Smith and defensemen John Klingberg scored for Dallas. Ben Bishop made 19 saves. ISLANDERS 2, HURRICANES 1: Anders Lee had a goal and an assist, and New York won at Raleigh, North Carolina. Ryan Pulock scored the go-ahead goal late in the second period and Josh Bailey had two assists for the Islanders.